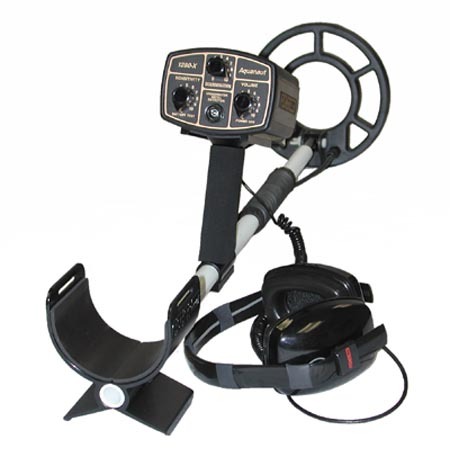 All purpose metal detector engineered to do the job on land in the surf or 250 feet deep. Simple.Only three controls - just set them and search. Lightweight, near perfect balance, foam grip, adjustable arm rest. Only slight search coil motion required for positive target response and quick pinpointing. Versatile.Works in salt water, fresh water or on land. Control box slips off for belt mounting. Shaft telescopes from 33 to 49 inches. Detects all metals or ignores small trash. Rugged. Watertight to 250 feet. Stainless steel arm rest, fiberglass shaft, hi-impact injection-molded control box, waterproof headset, lightweight solid glass-bead epoxy search coil. Built to take a beating! Economical. Patented State-of-theart circuitry delivers up to 75 hours of stable, deep-seeking metal detection on a single pack of penlight batteries. Virtually no maintenance required. 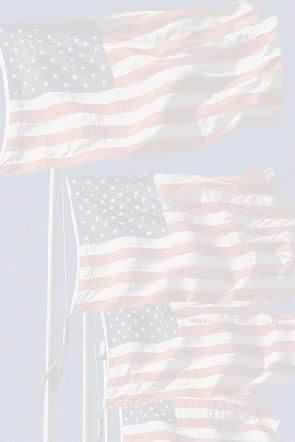 Lifetime Warranty - On All Fisher Hobby Detectors Backed with pride by the world's oldest name in metal detectors. Write or phone for more Information or the name of your nearest Fisher dealer. Salt water, fresh water or land use. Up to 75 hours of battery life. Ignores small pieces of trash. Audio and visual target response. Weight Complete (with headset) 5.1 Lbs.. . . 5.4 Lbs. Handle and Search Coil 2.3 Lbs. . . .2.6 Lbs. The 1280-X Aquanaut is available with either an 8 inch diameter search coil or a 10.5 inch diameter "Spider" coil (as shown on the reverse). 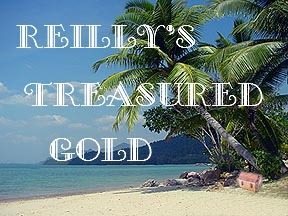 Searchers working on rocky, uneven terrain, in thick underbrush, in salt water or high density trash areas generally prefer the quieter operation of the 8 inch coil and its ability to zero in on good targets closer to junk. Pinpointing is also easier with the 8 inch coil and it's easier to get into confined areas. The 10.5 inch coil will go slightly deeper-5% to 20% in air, less in soil depending on target size and ground mineralization. The most noticeable improvement will be on targets larger than coin-size in non-mineralized soil. Equally important, its wider scan will cover more area with each sweep. POWER ON-OFF/VOLUME. Dual Function Potentiometer and Switch. BATTERY TEST/SENSITIVITY. Dual Function Potentiometer and Switch. VF-DISCRIMINATION. Full Range Trash Rejection Potentiometer. 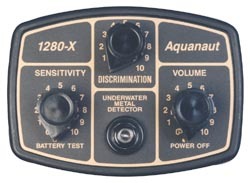 Book: "Advanced Shallow Water Treasure Hunting With The 1280-X Aquanaut"